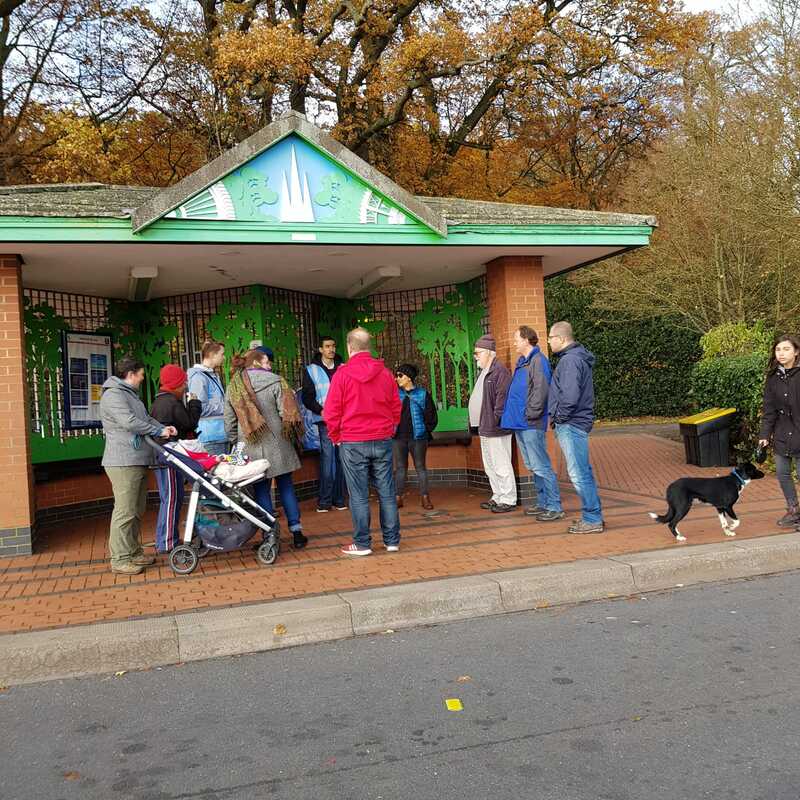 A small but enthusiastic crowd of people gathered at the Park & Ride in the War Memorial Park at 1pm on 11 November, Remembrance Sunday and also the 100 anniversary of Armistice Day, to begin the world’s first-ever PeaceTwalk. 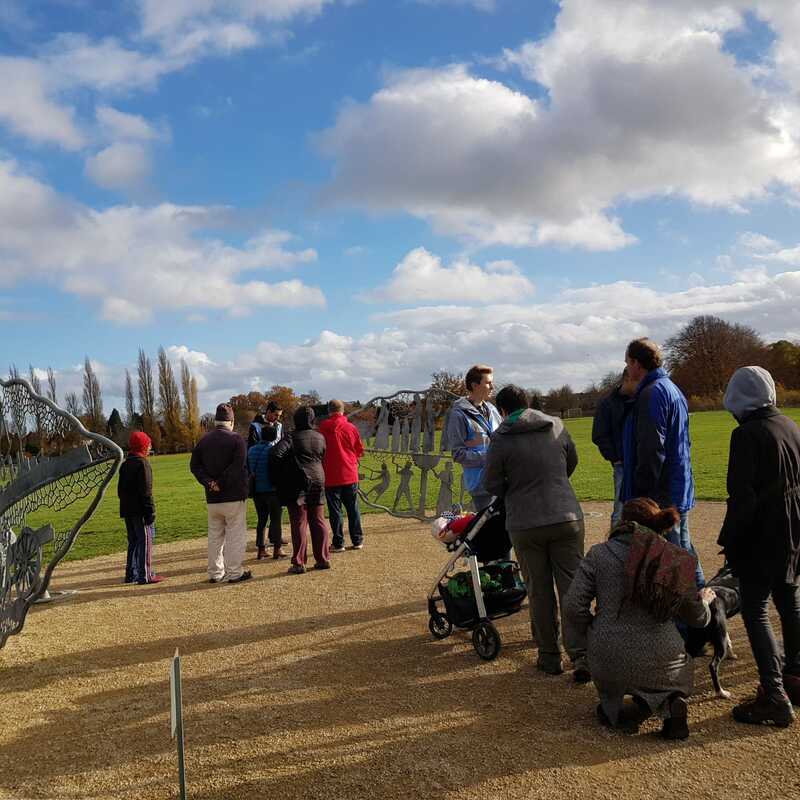 They walked around the park, visiting locations related to peace, guided by students from Coventry and Warwick Universities who are among the United Nations Association (UNA) Coventry Ambassadors this year. Admittedly they were far fewer in number than the thousands who had followed the Remembrance Service held at the War Memorial at 11am, but the Twalkers had come to take some positive steps towards forming good community relations by walking and talking to people from different communities, religions, races, cultures and sharing a little time and information. At each of the ten stops along the walk, the guides talked about the history and significance of each venue and asked questions to provoke conversation. At the end of the walk they were invited to sit and talk about the experience, and discuss how the PeaceTwalk could be improved in the future. So what were the lessons of the afternoon? A number of people had come as couples. We had anticipated this and had planned to ask people to split up and each follow a different guide. But it turned out people were very reluctant to do this, preferring to stay together. During the discussion over a drink we talked about this and it was suggested that in future we organise the event in an indoor location so that couples would still be close but could be more easily persuaded to separate for a short time to talk to a stranger. In addition, holding an event indoors would overcome the problem of adverse weather. Fortunately the day was beautifully sunny, but it could easily have been raining, which would have had a very adverse effect upon the number of people who attended and the enjoyment they got from the day. What sort of venue could be used? Part of the attraction of the event was the idea of walking, when one can easily swap partners. Sitting in a hall would not give you the same flexibility. Coventry is fortunate to have a number of covered locations that could be used, for example the Lower Precinct, or the Cathedral, which are large enough to walk around. UNA Coventry are very pleased with this event, and very grateful to UN Ambassadors Lana, Randa, Khalid, Blazej and Malikia for their leadership of the groups. This was the first and will not be world’s last last PeaceTwalk.